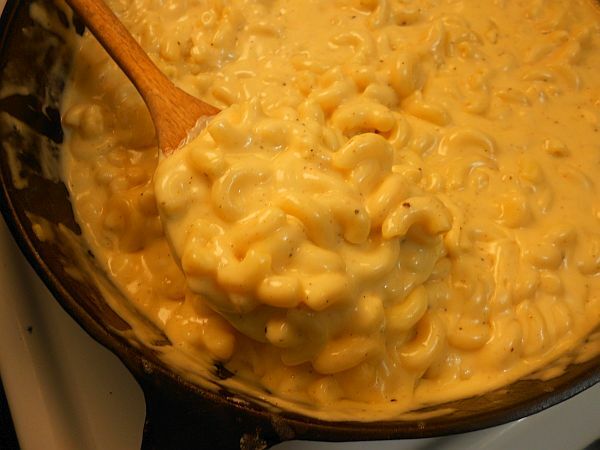 < When you have a craving for macaroni and cheese, the big question that comes up for most people today is: mac and cheese from a box, or homemade mac and cheese? Besides being far, far cheaper, boxed mac and cheese is simple to prepare...and if you're not careful, a homemade mac and cheese can turn out with a cheese sauce that's far too thick and goopy. While this stuff tastes good, it doesn't look very appealing. But when you take the time to prepare a good cheese sauce, then stovetop mac and cheese is far better than any of the stuff sold for 50 cents a box in the supermarket. > When you have a craving for macaroni and cheese, the big question that comes up for most people today is: mac and cheese from a box, or homemade mac and cheese? Besides being far, far cheaper, boxed mac and cheese is simple to prepare...and if you're not careful, a homemade mac and cheese can turn out with a cheese sauce that's far too thick and goopy. While this stuff tastes good, it doesn't look very appealing. But when you take the time to prepare a good cheese sauce, then stovetop mac and cheese is far better than any of the stuff sold for 50 cents a box in the supermarket. > The golden rule for a roux is equal parts oil and flour, and that's why we're using 4 tablespoons of butter and 1/4 cup of flour. Meanwhile, the rule for adding milk to a cheese roux is supposedly "eight times the amount of the roux." Since this recipe uses a roux that's about 1/4 cup in volume (1/4 cup butter plus 1/4 cup flour), eight times the amount for milk would equal two cups of milk. If we were using half a cup of flour and a full stick (1/2 cup) of butter, we would need to double this to four cups of milk. > ** The formula for the amount of the milk is ''eight times the volume of the roux.'' The roux is 1/4 cup in volume (1/4 cup butter plus 1/4 cup flour), and 1/4 * 8 = 2 cups of milk, with a little extra milk added as well. < The golden rule for a roux is equal parts oil and flour, and that's why we're using 4 tablespoons of butter and 1/4 cup of flour. Melt the butter in a cast iron skillet over low-to-medium heat, in order to prevent the butter from burning. Whisk the flour into the butter to make a roux. > Melt the butter in a cast iron skillet over low-to-medium heat, in order to prevent the butter from burning. Whisk the flour into the butter to make a roux.